For the last two weeks we have shared with you a little about Otto’s experience in the ICYER Ashram. 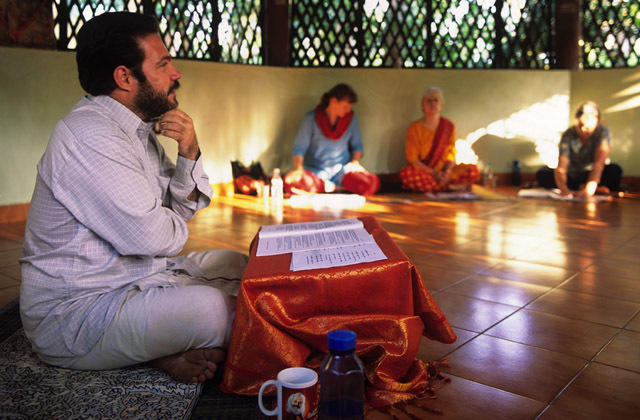 This week Otto summarizes his three-week experience and what to expect in a traditional ashram. You live with the Guru and his family. Here it is Ammaji (Meenakshi Devi Bhavanani), her son Dr. Ananda, his wife Devasena, and their two children. You are there for a long time. You follow a strict ashram routine (see below). There is a very close relationship between Guru (teacher) and chela (student). The number of students is small. This year there were only 4 students in the 6-month course. At 4:30 AM you get up with the wake up bell, and the daily Aarti (fire ceremony) is at 5 AM. While night is still upon us, the stars are shining like diamonds in the sky, we go to the Hatha deck and do a silent sitting (Amma does not call it meditation), followed by Hatha Yoga until 8 AM. The coolness of the night and seeing the sun rising is a wonderful way to begin the day in this quite hot climate. This first block ends with relaxation (15-20 minutes). At 8 AM the wonderful Shanti serves for sure the best dosa in all Tamil Nadu. Then, there is not too much time before the one-hour Karma Yoga starts at 9 AM, one hour of selfless service for the ashram. It can be cleaning the toilets, working in the garden, or as in my case cleaning the kitchen. At 11 AM Pranayama starts and lasts until 1 PM. ICYER is endlessly rich in Pranayama techniques. The techniques are often shown in a supine (lying on your back) position, and all students, including me, often fall asleep (which is obviously not the goal). After the lunch break, Dr. Ananda teaches all aspects of yoga, especially philosophy. After dinner, we sing some bhajans (devotional songs) and normally Amma gives satsang (spiritual teachings or readings) until nearly 9 PM, which is also bedtime, as the next day once again starts early. Every daily activity is signaled by a bell, and be sure to take note of one of the most important points of ashram living: always be on time! Most students of the 6-month course have never been late, not to one single event of the day. On top of this, you have to attend every single class, even if you are damn ill! One day per week is a day off (theoretically, at least half day – sometimes). What does ashram life give you? I became incredibly stable, you do not have a mood which is good or bad – you are just light and stable. Maybe you can say, I am not sure, that your real character is revealed? I hope that this is my real character. Even though I have to admit that 4:30 AM is not a normal time for me, nor did I get my normal amount of sleep, I was not tired and I still had an amazing amount of energy. My need for daily vices (like chocolate or alcohol) disappeared. I had the chance to listen, and I became quiet in voice as well as in mind and breath. You really feel different if you go out. It disturbs your sadhana just if you go out to see the loud streets. You are permanently thrown back on yourself to confront who you really are (and you cannot run away or do those things that normally distract you in western life). One day I had an illness (I thought I might die, you know when something really heavy comes), and within 24hrs I was magically cured. Time feels different. You are in the “here and now” as they say. Mostly, time passes slowly and intensely. During my visit at the same time last year mosquitoes seem to have eaten me alive. This year I had far fewer bites (maybe they feel the different lifestyle?). The warm climate in South India at this time makes it a wonderful experience too, and in front of the ashram is a surf beach, yeah! 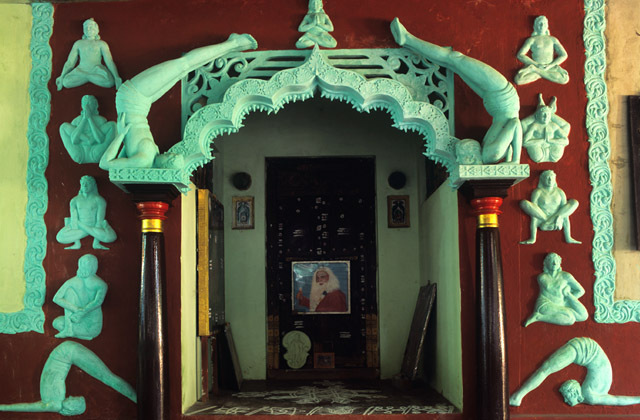 To start your own ashram experience, you can find a list of yoga centres in India on our website, including ICYER.